So many of us had issues with frozen pipes last year because they were not insulated well enough to resist the deep, freezing temperatures that we experienced. Others of us, had issues with large icicles that weighed down gutters and posed a safety hazard for those that walked by. Now is the time to prevent those situations from happening this winter by installing pipe insulation and/or heating cables at problem areas. Problem: Pipes are freezing either in areas that are poor insulated or not insulated at all. 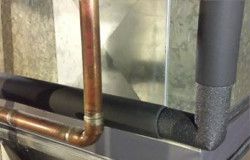 Solution: Install pipe insulation around the water supply lines for both the hot water and the cold water. You will also want to inspect areas around these pipes that are poorly insulated and might be causing a draft of cold air. If the situation is really bad and insulating still may not provide enough warmth for the pipes, you may want to install heat cables to the water lines. These turn on automatically when temperatures of the pipe reach a certain level. They are easy to install and work through a standard 120 volt plug. Problem: Long, dangerous icicles are forming. Or the freeze/thaw around the gutters has caused water to penetrate inside the home through areas that are not watertight. Solution: Install roof and gutter de-icing cables along the gutters/roof line to ice dams when needed to keep your gutters free flowing. These must be installed now, so they they prevent the ice from forming and lay tight to the roof shingles. Professional roofers may be necessary to perform these the next two steps, but you may want to consider ways to vent the attic space below the roof, so that those temperatures changes are not experienced. Also proper insulation above the interior ceiling will also prevent the heat from raising and melting the ice dams from underneath. Pipe insulation and heating cables are handy products to use during the winter months, but now is the time to install them. So if you have battled with freezing water pipes and melting ice dams, then you might want to consider some of these do-it yourself solutions.